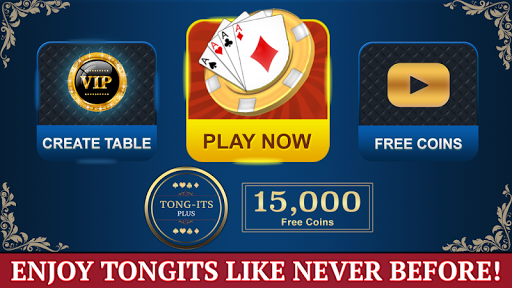 #1 FREE TONGITS GAME Free Daily Coins! Download the Best Offline Tongits Game! Tong-its is a three-player knock rummy game that has become popular in the northern Philippines in recent years. Download now and get 15,000 FREE COINS. ✔ Update Profile Picture & update Username. ✔ Select Room of particular bet amount. ✔ Game settings includes i)Animation speed ii)Sounds iii)Vibrations. ✔ Manually rearrange cards or auto sort. ✔ Get Free Coins by Inviting Friends. ✔ Simple tutorial to help beginners get in the game fast. 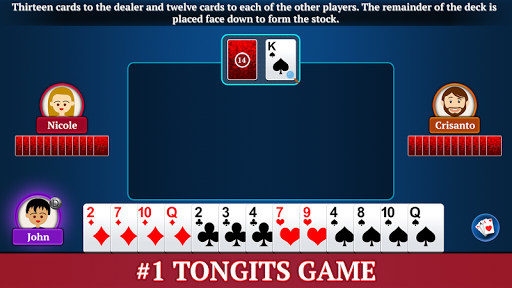 Tong-Its is a game for three players only, using one standard Anglo-American deck of 52 cards (without jokers). The cards in each suit rank: Ace 2 3 4 5 6 7 8 9 10 Jack Queen King. An Ace is worth 1 point, Jacks, Queens and Kings are worth 10 points each, and all other cards count their face value. The object of the game is, by drawing and discarding, to form sets and runs, and to to minimize the count of unmatched cards remaining in your hand. A run consists of three or more consecutive cards of the same suit, such as ♥4, ♥5, ♥6 or ♠8, ♠9, ♠10, ♠J. (A-K-Q of a suit is not a run since aces are low in this game). A set consists of three or four cards of the same rank, such as ♥7, ♣7, ♦7. A card can belong to only one combination at a time - you cannot use the same card as part of both a set and a run. The first dealer is chosen randomly. Thereafter the dealer is the winner of the previous hand. The cards are dealt one at a time counterclockwise, starting with the dealer: thirteen cards to the dealer and twelve cards to each of the other players. The remainder of the deck is placed face down to form the stock. Draw You must begin by taking one card from either the top of the stock or the top card on the discard pile, and adding it to your hand. You may only take a card from the discard pile if you are able to create a meld (a set or run) with it, and you are then obliged to expose the meld. Exposing Melds If you have a valid meld or melds (sets or runs) in your hand you can expose any of them on the table in front of you. Melding is optional if a card was taken from the stock; you are not obliged to expose a meld just because you can, and note that melds held in hand do not count against you at the end of the play. 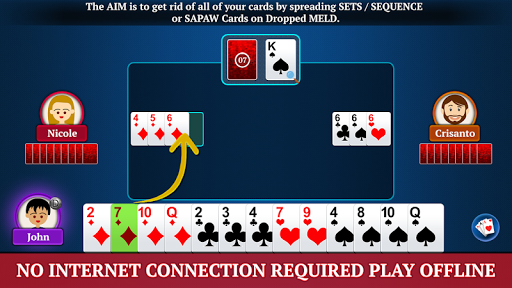 A player must lay at least one meld on the table for the hand to be considered opened. In the special case that you can meld a set of four and you have not drawn from the discard pile to complete the meld, you can lay the set of four down face down. By doing this you can "open" your hand without losing the bonus payments for a secret set of 4 and without revealing the cards to the other players. Laying off (sapaw) This is also optional. If you wish, you may add cards to sets or runs previously melded by yourself or others. There is no limit to the number of cards a player may lay off in one turn. A player need not have opened their hand to lay off. Laying a card off on another player's exposed meld prevents that player from calling Draw on his or her next turn. Discard At the end of your turn, one card must be discarded from your hand and placed on top of the discard pile face up.